Richard was a native of Albuquerque, graduated from Highland High School in 1966 and received a Bachelor’s degree from the University of New Mexico in 1971. His parents were Doctor Harold L. and Gladys H. Freedman. Richard’s great passion in life was reading books. He was a lifelong student who enjoyed all kinds of literature, particularly science, mathematics, and history. Richard regularly borrowed books from Albuquerque's public libraries and was a dedicated public library supporter. Richard left his estate for the benefit of the Public Library Albuquerque Bernalillo County. 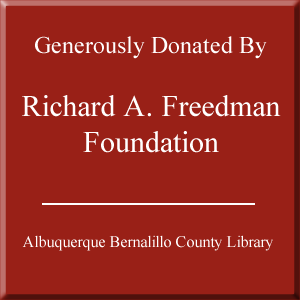 The resulting Richard A. Freedman Trust enhances the public library’s collection and provides designated areas for reading, study and contemplation. Richard’s generous legacy will have a positive impact on generations of Albuquerque citizens.